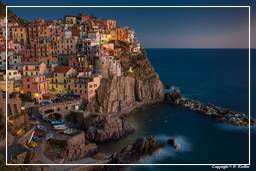 Liguria is a coastal region of north-western Italy, where Genoa is the capital. The region is popular with tourists for its beaches, towns, and cuisine. Liguria is bordered by France to the west, Piedmont to the north, and Emilia-Romagna and Tuscany to the east. It lies on the Ligurian Sea. The narrow strip of land is bordered by the sea, the Alps and the Apennines Mountains. Some mountains rise above 2,000 m; the watershed line runs at an average altitude of about 1,000 m.